His contention is that if some species of ‘non-human animals’ can be shown to be smarter, more aware, more humanlike than previously recognized, then they arguably deserve legal rights. When Wise was asked if an adult chicken should have more rights than a human embryo, he said that if the chicken has more ‘appreciation for life’ than the human embryo, then yes, the chicken should have more rights. The Washington Post, <www.washingtonpost.com/wp-dyn/articles/A60634-2002Jun4.html>, 7 June 2002. But will the chimpanzees, chickens, etc., be able to find lawyers from within their own species? Such movements are the inevitable results of our society’s evolutionization. Researchers speculate that if Mars today were to become warmer and the ice melted, it would inundate the planet to an average depth of 0.5–1 km (0.3–0.6 miles). Science, 5 July 2002, pp. 60–61, 75–85. BBC News, <news.bbc.co.uk/hi/english/sci/tech/newsid_2013000/2013114.stm>, 21 June 2002. The earth is 70% covered by liquid water, enough to cover the whole globe to 3 km deep if the surface were evened out. Yet the physical evidence for a global flood on earth is deliberately ignored, along with the biblical account of the man Noah who lived on this planet (not Mars). A girl, now seven years old, who had the left hemisphere of her brain (where language capacity is thought to reside) removed at the age of three, has become fluent in not one, but two languages. The Daily Telegraph (UK), 23 May 2002, p. 6. Evolutionists cannot satisfactorily explain the body’s fantastic built-in capacity to compensate for loss, since natural selection can only select for characteristics necessary for immediate survival. Such brain injuries would have been fatal in the circumstances in which humans were supposed to have evolved. Dolly herself has defects including shortened telomeres—the DNA tips that protect the end of the chromosomes—one consequence is that Dolly is prematurely aged. Other cloned sheep, cattle and pigs suffer a range of defects, including gigantism, deformities of the heart and lungs, sudden failure to produce white blood cells, laboured breathing because of abnormally thick muscles around the heart, and malfunctioning immune systems. In mice, placentas have been up to four times the normal size. The Sunday Times, 28 April 2002, p. 11. See also editorial this issue. The extinct giant pterosaur Hatzegopteryx had a wingspan of 12 m, but its colossal skull was three m long, raising questions about how it ever got off the ground. It appears that the key to its flight was the very peculiar internal structure of the bones—a dense network of very thin trabeculae (bands of connective tissue) enclosing small alveoli (like honeycomb cells)—somewhat reminiscent of expanded polystyrene, i.e. combining strength with lightness. New Scientist, 16 March 2002, p. 24. Transmitted by flea bites, Bubonic Plague decimated Europe’s human population in the 14th century. Researchers have confirmed that it was a single gene, transferred from another organism, which turned a minor stomach bacterium into plague. This gene somehow enables the plague bacterium (Yersinia pestis) to survive in the midgut of a flea. But at least since the 14th century the bacterium has relied on fleas for its transmission, having lost the ability to survive in the outside environment. The researchers speculate that this reliance on the rat flea may also have boosted the bacterium’s virulence. Further evidence that losing an ability makes germs more dangerous comes from a recent study of the bacterium Vibrio cholerae, which causes cholera. The germ becomes ‘markedly’ more infectious if it loses an ability called chemotaxis, the ability to move in response to changes in chemical concentrations. New Scientist, 4 May 2002, p. 9. Science, 26 April 2002, pp. 733–735. Nature, 6 June 2002, pp. 642–644. Fossil tracks from a sandstone quarry in Canada—made by a 30 cm (1ft)-long arthropod (a segmented animal with external skeleton, like a millipede)—have astounded experts because they are in Cambrian rock, allegedly 544 million years old. The date at which sea animals came ashore was once claimed to be the Silurian, which allegedly started 440 million years ago. Then it was the Ordovician, which started 490 million years ago, and now this evidence pushes it ‘back’ another 40 million years. The date at which many-celled animals first arose has also been pushed back. Current theory says it was 600 million years ago. But now impressions in sandstone rocks of Western Australia that appear to be the trails of an earthworm-like creature have been ‘dated’ at over twice that age, from 1.2 to 2.0 billion years old. For evolution-believers, this leaves even less time for evolution to have supposedly wrought its work. Science, 10 May 2002, pp. 1112–1115. Nature Science Update, 10 May 2002, <www.nature.com/nsu/020506/020506-10.html>, 30 May 2002. Geology, May 2002, pp. 391–394. Evolutionary ‘dates’ are really just relative positions in the strata that were mostly laid during the global Flood (see The way it really is: little-known facts about radiometric dating). Dates getting ‘pushed back’ simply means that a fossil has been discovered at a lower level. Thus, we can expect this phenomenon to keep recurring. And geologists are also rethinking the more popular view that the early earth was a barren, crater landscape covered in molten lava. A 4.4-billion-year-old zircon crystal found in Western Australia led researchers to conclude there must have been liquid water present when the rock containing the crystal was formed, implying that the early earth was not so hot after all. New Scientist, 15 December 2001, p. 15. New Scientist, 20 April 2002, p. 18. The facts are that the early earth’s surface was neither frozen nor red-hot; it was (briefly) completely covered with water (Genesis 1:1–9) and later re-covered for about a year (Genesis 6–8). Classical ‘big bang’ theory has a number of serious difficulties. To solve some of these, physicist Alan Guth proposed ad hoc that the universe once underwent a period of very rapid growth, called ‘inflation.’ But it seems that this has some of the same problems. So, to solve these, some physicists have proposed that the speed of light was much faster in the past. This is supported by measurements of a number called the ‘fine structure constant,’ which is a combination of supposedly unchanging physical ‘constants’ like the speed of light. Analyzing light from distant quasars in 1999 showed the value of this ‘constant’ to be different from today. New Scientist, 19 January 2002, p. 4. New Scientist, 2 March 2002, p. 7. Astrophysicists suggest that intense gamma ray bursts (GRBs) from space may have occurred around 1,000 times since life began, affecting how species evolved. They say GRBs could have eroded the ozone layer, exposing life to solar UV radiation, thus causing higher levels of mutations in many organisms—‘possibly even kick-starting their evolution’. New Scientist, 15 December 2001, p. 10. Such ‘molecules-to-man’ stories do not fit reality: mutations (from whatever cause) never result in an increase in information and functional complexity. Rather, even in the rare instances where they give a survival advantage in a given environment, they always seem to involve loss of genetic information. No scientist would stand in front of an X-ray scanner to ‘kick-start evolution’ in his/her offspring. In the quest to find life elsewhere in the universe, NASA is hoping to find ‘hundreds of earths’ using its new Kepler spacecraft, due to be launched in 2007. 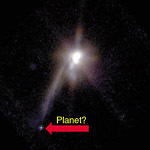 However, the assumed planets so far thought to be orbiting other stars (e.g. the faint point in the picture here) would all be massive gas giants like Jupiter, and so unlikely abodes for life. And in our solar system, spacecraft have scanned, at least briefly, almost every planet and sizable moon, but earth is the lone proven site of life in the universe. There is no biblical reason why God should not have formed other planets as well as those in our own solar system. Whether there is life on any planet other than earth is another matter. See Creation 22(4):40–43. The recent death of ‘the public face of evolution,’ Stephen Jay Gould, received widespread media coverage. While his ideas of ‘punctuated equilibrium’ put him at odds with ‘slow-and-gradual’ evolutionists [e.g. Richard Dawkins], Gould stood united with them in opposing creationists. He was at the forefront of legal/political battles over the teaching of creation/evolution in American public schools. Nature, 13 June 2002, p. 706. Science, 14 June 2002, p. 1984. One of the founding members of a museum built in Roswell, New Mexico, USA, to proclaim the supposed 1947 UFO crash in that area, has changed his mind. Karl T. Pflock, a former CIA intelligence officer who still believes that some UFOs really are alien spacecraft, conducted an eight-year painstaking examination of the Roswell case and concluded that the crash debris resulted from secret high-altitude balloon research for the US military. Facing accusations of ‘traitor,’ Pflock cautions that ‘belief is no substitute for critical thinking.’ He argues that belief in alien spacecraft has become something of a substitute for traditional religion. In this evolutionized secular age, UFO obsession becomes an ego boost by reassuring the believer that we really are important in the cosmos (because aliens keep coming to visit us). Review—Roswell: Inconvenient facts and the will to believe, <astrosociety.org/books/books0601-2.html>, 25 July 2002. New research suggests an important gene-repair role for ‘junk DNA,’ which makes up nearly half of all human DNA. It now seems the so-called junk DNA can jump to chromosomes with broken strands of DNA, slip into the break and repair the damage—an essential function in keeping the cell alive. 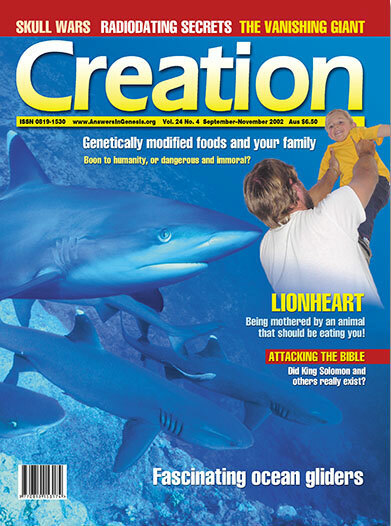 Nature Genetics, 1 June 2002, pp. 159–165. As we have said many times (e.g. Creation 10(4):17; 22(4):33–35; 23(3):16–19), evolutionists would have been wiser to withhold their previous judgments (in the 1970s) that 99% of the human genome was useless evolutionary leftovers.